Humanists in wealthy, democratic countries have an opportunity to do something to help our peers around the world who are facing death threats for open expression and liberal values. Every week, hundreds of Unitarian Universalist congregations donate to wonderful causes through Share the Plate, a tradition of sharing funds from the weekly collection with charities and community causes. All secular communities- from Humanistic Judaism to Sunday Assembly- have the possibility to take up special collections to defend the human rights of secularists overseas. Imagine if one month out of the year, all secular and humanist groups in the US raised funds to support individuals facing violence overseas for their beliefs. The impact could be substantive. Here are two secular human rights causes to consider gathering a special collection for. Your investments truly matter. 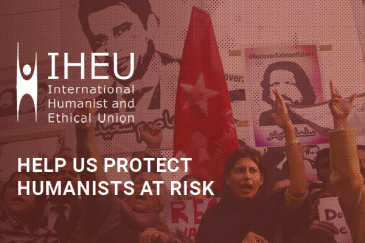 1. International Humanist and Ethical Union - The IHEU is a representative body of secular member organizations, including the UU Humanist Association, that advocates for universal human rights and the rights of the non-religious. Through the annual publication of the Freedom of Thought Report, the IHEU, "provides a detailed overview of areas where the law, policy and practice of states discriminates against the non-religious." The report is a what's what of justice and injustices faced by humanists in the legal systems around the world. Alongside advocating for policy change, the IHEU directly provides logistic and support services for individuals seeking asylum for their humanist beliefs. Your gifts support their work. 2. Secular Rescue - A project of the Center For Inquiry, Secular Rescue is an organized effort to provide emergency assistance "to writers, bloggers, publishers, and activists who face threats due to their beliefs or expressions regarding religion." The group has spent over $100,000 in the past four years, supporting dozens of individuals move to safety. Shammi Haque, a Bangladeshi writer, faced death threats for her work. She told CFI, "I want only one identity: ‘Human being.’ All of my activism and my writing is for my first identity.” With help from Secular Rescue, Shammi was able to find refuge in Germany. Any person or group can donate to CFI through their website and designate the gift specifically for Secular Rescue, or reach out to the Vice President for Philanthropy, Martina Fern, to discuss ways to support the program. Democracy and freedom of conscience are beautiful, powerful, hopeful values that we share as humanists. We can use special collections in our fellowships, clubs and congregations to advocate for and support our peers around the world who champion democracy and secularism- and currently face imprisonment or death for it. Contact or get involved in your local community's leadership today- it's never too early to start a collection! The rotten systems in this world will get better- if we get our communities involved to change them and support our neighbors. Daniel Braga-Lawlor is a proud Rhode Island ex-pat, and is in love with Northern California. Past President of Bell Street Chapel, a small and mighty Unitarian Universalist congregation in the West End of Providence, RI, Daniel is active with Sunday Assembly East Bay (Berkeley-Oakland area). Collaborative, engaged communities energize and inspire Daniel.